Plantar fasciitis is an all too common foot disorder that causes affected patient severe, chronic foot pain. The plantar fascia is the connective ligamentous tissue that connects the heel to the toes. When this fascia becomes inflamed, patients experience varying degrees of pain in the bottom of the foot, particularly around the heel. Walk or standing will markedly worsen the pain. Typically patients will get out of bed in the morning and their first steps are quite painful. As the day goes on the pain can improve but with prolonged standing, walking or running the pain can worsen. There are approximately 2 million new cases of plantar fasciitis diagnosed in the United States, annually. The overall incidence of plantar fasciitis is about 10% of the US population. Plantar fasciitis is diagnosed on the basis of history and careful examination. Foot x-rays may be taken to exclude underlying arthritic conditions or stress fractures of the bones of the foot. One can also see a spur on the heel bone. 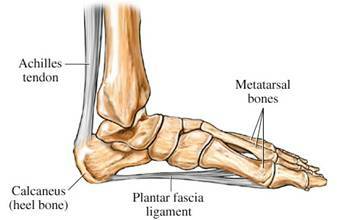 It is not the spur that causes the pain but rather plantar fasciitis causes the spur to form. It may be necessary to get an MRI of the foot to look for other causes of foot pain such as neuromas – painful small nodules of nerve tissue – or other causes of foot pain. Treatment of plantar fasciitis consists of daily stretching of the calf and foot muscles. It is particularly important to stretch the Achilles tendon. This stretching, done over a period of months, frequently results in lessening of the pain and eventual resolution of the problem. Stretching prior to going to bed and first thing in the morning prior to getting out of bed is most important. Good foot wear that provide arch support can also be helpful, as can shoe orthotics. Anti-inflammatory medications such as aspirin, ibuprofen or naproxen can be helpful in relieving the pain. Cortisone injections may provide temporary relief, but can sometimes provide long lasting relief. Repeated steroid injections are actually harmful in that they can cause tissue breakdown and even rupture of the plantar fascia. Surgery may be used in some cases. Unfortunately there is a significant risk of infection, nerve damage or failure to relieve the pain. This can also weaken the plantar fascia, resulting in dropped arches and other long term foot problems as well as pain. Platelet rich plasma can be of benefit to patients with plantar fasciitis. With the PRP therapy, there is healing of the damaged, inflamed plantar fascia. The PRP initially induces slightly more inflammation, part of the healing process, but then the fibrinocytes move in and start laying down new collagen to heal and reinforce the plantar fascia. Other healing components of the blood, such as stem cells migrate into the area, rebuilding and strengthening the tissue. With PRP there are none of the down side effects of repeated steroid injections, especially no tissue breakdown – quite the opposite,. Platelet rich plasma therapy results in tissue regeneration. As with all injection procedures, there can be damage to neurovascular structures, infection, pain and lack of beneficial effect but the risk of these with PRP is very low. You should seek out a physician that is knowledgeable about platelet rich plasma to see if you may be a candidate for PRP therapy. Contact Sarasota Neurology for consultation for your foot pain.